Cover picture: Romford Market trader Kalyan Singh Premi serving a customer. 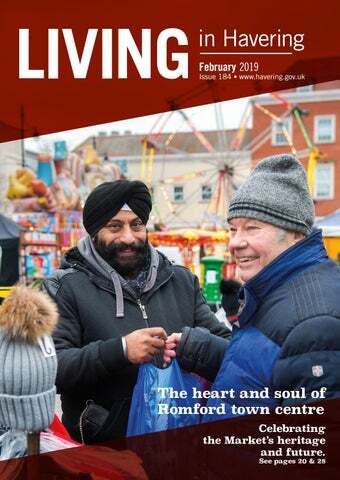 Welcome to the February edition of Living in Havering. In the run-up to Christmas thousands of you came to visit Romford Market and enjoyed the entertainment for all the family alongside the wide range of fashion, food and food stalls. In this edition we look back at a key moment in the history of Romford Market and at the attractions that Havering Council is planning for the months ahead. Strengthening our historic market is just one of my priorities to make Havering an even better place to live, and work, in 2019. Recently we announced plans to spend £10 million a year improving the condition of our roads and pavements in response to what residents told us is their number one concern. You can read more about this on page 15. Alongside this we are investing in making the borough safer and cleaner by earmarking £250,000 for better CCTV, keeping weekly bin collections, targeting fly-tippers and improving our street cleaning. However, the next four years will also bring us some tough choices. A reduced government grant means we need to find £37 million of savings and efficiencies. We have already started to do this but much more needs to be done. It is with this backdrop I will continue to protect and enhance the unique character of the borough while making sure that our sons and daughters can continue to afford to live here. That’s why we are bringing over £3 billion pounds of new investment to Havering to build more genuinely affordable homes, create new jobs, and improve our town centres and connections across the borough. I am sure 2019 will be another great year for Havering Council as we work towards a cleaner, safer and prouder borough for all our residents. I look forward to meeting you at one of my upcoming local surgeries, details below. Cllr Dilip Patel, Mayor of Havering A flag-covered jetliner float won Havering second place in London’s New Year’s Day Parade. It was the borough’s best ever result and resulted in winning £9,000 for Havering charities. This year’s theme - ‘London Welcomes the World’ attracted more than 650,000 spectators and 8,000 participants from 15 London Boroughs. Veggie Run, Havering Council's healthy living campaign for children announced a unique partnership with Stubbers Adventure Centre in January. The collaboration aims to offer primary, infant and junior pupils increased access to outdoor adventure at the largest activity centre in the Southeast. A unique partnership with Stubbers Adventure Centre To celebrate this partnership Stubbers Adventure Centre in Upminster, has created six bespoke Learning Outside of the Classroom activity days for primary, infant or junior schools. Classes could win this free day by encouraging pupils to eat a healthy school catered lunch from HES Catering Services. The activity days are a great opportunity for children to participate in archery, climbing, bush craft or woodland construction. These days have been designed to develop children’s independence, confidence and problem-solving skills outside of the classroom. Competition time for children To ensure as many Havering pupils can benefit from this new friendship, Veggie Run is offering 20 children and their parents or guardians aged over 18 years old a chance to also win a free visit to Stubbers Adventure Centre for a Family Adventure Day on Saturday 11 May, Sunday 19 May, Sunday 2 June or Sunday 23 June. To be entered with a chance to win, pupils just need to eat a healthy school lunch every Tuesday in March. The day will kick off at 9.15am and finish at 4.30pm. The 20 lucky pupils will be notified of their prize via their schools on Friday 29 March. A Havering school has been celebrated by Transport for London (TfL) for their work championing active and safe travel on the journey to and from school. YTA team promoted cycling as an enjoyable and healthy way to travel. During their Smoothie Bike promoBritish day, thefurniture group Assembled spoke to over 100 pupils during aboutBespoke the benefits Madelunchtime to Measure Beds of cycling and how they could take part in the campaign. Winners all One of the highlights of our local sporting calendar year is the Havering Sports Council's Annual Presentation Buffet. Sponsored by McDonald’s Restaurants of Romford, this year’s event was held on 11 February at Upminster Golf Club in the presence of the Mayor of Havering, Cllr Dilip Patel. Eight awards were presented. In addition to their awards, winners in the first three categories also received a £200 cheque donated by Lodge Farm Tennis Club. (Sponsored by West & Coe) Max Law – Athletics. Max has continued to display great improvement in his chosen event – the javelin. A series of top performances led to him being picked for the European Under 18 Championships in Hungary. Progress saw him in Great Britain colours by July where he threw a personal best of 75.3 metres which was the second-longest throw ever by a British Under 17 athlete. (Sponsored by MDS Printers of Upminster) Shandell Taylor – Athletics. Fred Alsop is Havering Athletic Club's greatest ever athlete, having been selected for three Olympics in the 1960s. So when an athlete comes along who can beat one of Fred's club records, which has stood since 1964, he truly deserved the kudos this feat attracted. Shandell's 2018 improvement was eye-catching as he progressed from a good standard club athlete to being the UK’s No.1 ranked long jumper for his age. (Sponsored by the Beadle Family) Keiran O'Hara – Athletics. 19 year-old Keiran, who belongs to Havering Athletic Club, excels at 400, 800 and 1500 metres events as well as crosscountry running. He has autism and learning difficulties and attends Havering College's Unit for Special Needs. At the Eastern Region Disability Championships he won gold medals at both 400 and 800 metres. (Sponsored by Cllr John Mylod) Tony Benton – Athletics. Tony is chairman of Havering Athletic Club. He’s also a committed coach of both hurdles and sprints events and has a successful squad under his wing – three of whom became national medalists. (Sponsored by Brentwood M&E Services Ltd) Coopers Company & Coburn Intermediate Girls Athletics Team This team became National Champions, beating over 600 schools, having improved on their runners-up position of a year earlier. At the grand final at Gateshead they scored a record 520 points and achieved an event record winning margin. Being the most successful team in the competition's history made it a formality for them to earn selection to represent England at the World School Athletics Championship in Croatia. (Sponsored by Cllr Melvin Wallace) James Oglethorpe School Girls Cricket Team In 2018 it was decided to introduce pupils to cricket, which commenced with a once-a-week after-school session. It caught on and soon this school were playing in the Havering Kwik Cricket Tournament. They won all their group games. These victories saw them qualify for matches against winners from across Essex. At this higher standard they made the final four. Organisers of the tournament praised them for their team spirit. (Sponsored by Moments of Memory Photography) Hornchurch Cricket Club 2018 was the best of their 235 year history as they won 'The Treble': the Essex Shepherd Neame Premier League, the Essex League Cup and the Essex 20-20 Competition. This has never been done before. The icing on the cake was that seven of their regular best first-teamers were home-grown talent who'd come through their youth 'Cricket-for-All' programme. The Sapphire Ice and Leisure centre in Romford is one year old. Its opening on 3 February 2018 kick-started an ice hockey revival in the area and the Sapphire-based Raiders team have enjoyed a very successful year. Their rapidly growing fanbase love the new rink, enjoying the comfort and warmth whilst encouraging their new favourite team. 'Sold out' signs are expected to be seen again outside the Sapphire centre for Raiders’ home matches before the end of the season. The Raiders Ice Hockey Club now boasts a full junior development system with GB national team coaches teaching youngsters from four years of age right up to the under 18 and Division 2 Raiders teams. square and purchase various items of equipment. Cranham Community Association received £14,000 to progress repairs to the roof and flooring. The majority of the awards went to community projects in parks and open spaces, which are due to be delivered by Havering Council, in partnership with local organisations such as Friends of Parks groups. Improvements will be made at Spring Farm Park, Gidea Park, Bedfords Park, Raphael Park, Dagnam Park, Lodge Farm Park, Fielders Field (next to Langtons House and Gardens), Granham Brickfields, Rise park, Brittons Playing Fields, and Harold Wood Park. If you work or volunteer for an organisation interested in seeking funding from the Veolia Havering Riverside Maintenance Trust for a project that will benefit the community in the Havering area, you should contact Gary Baker: gary@vmts.co.uk. “We’re geared up to help rough sleepers with vital help and support” Cllr Joshua Chapman, Cabinet Member for Housing Ensuring that no one needs to sleep on the borough’s streets is one of the key priorities for Havering Council. Regular checks of Havering's streets The Council has been carrying out regular checks of the borough’s streets in order to identify and help people sleeping on the streets. It's been working in partnership with the police, charities, local residents and voluntary organisations to ensure that the message gets out to those most in need. Rough sleepers have access to our hostels, the Hope4Havering night shelter, meals at the Salvation Army, as well as other venues across the borough, where food, shelter and support are being provided. During the official count in November 2018 two rough sleepers were identified in the borough, in addition to the homeless people who have been provided with temporary and longterm accommodation. “We recognise that the count is a snapshot in time and also carry out a bi-monthly count based on local intelligence gathered from police teams in all 18 wards targeted at rough sleeping hotspots. If members of the public wish to support rough sleepers and other homeless people, we encourage them to give to charities supporting them rather than people begging on the streets as they may already have accommodation and be receiving support” said Cllr Chapman. Visit www.havering.gov.uk/roughsleepers for more information on how to help rough sleepers. SEE A ROUGH SLEEPER? TELL US You can report rough sleepers to help locate and support those that need assistance. This can be done online, via the StreetLink app or by calling 01708 431180 during work hours or 01708 433999 outside of work hours. Our team will provide rough sleepers with advice on what food/shelter/community services are locally available. W E D I S C U They S S are T then H Eencouraged I R N E EtoD goS to our offices to discuss their housing needs. Our outreach team will talk to the rough sleeper and assess their needs. They will then be given temporary housing or referred to the night shelter. temporary housing or referred to the night shelter. Havering Council ensures that nobody has to stay sleeping on the streets. If you notice NOBODY IS LEFT BEHIND Not all rough sleepers want our help to find someone sleeping we will do our best to build rough, you canhomes. In these cases Not all rough sleepers want our help to find up a relationship to understand individual contact the Council homes and sometimes they do not wish to circumstances. engage with us. In these cases we will do our on 01708 432824 or best to build up a relationship to understand 01708 431180, or on circumstances. Havering Councilindividual will support rough sleepers 01708 433999 during until housing solutions are found. Havering Council will support rough sleepers out of office hours. You can also inform the police or contact StreetLink via the app or on 0300 500 0914.
until housing solutions are found. Cllr Osman Dervish, Cabinet Member for Environment, said: “We have teams on stand-by 24 hours a day to make sure we keep the Borough moving, especially our emergency services, in the cold weather. Our staff have the tools and commitment to respond quickly to weather warnings to make sure our residents can get on with their lives safely and with as little disruption as possible.” When the borough is hit with wintry weather, as many roads as possible will be salted, with priority given to bus routes and other major roads. A dedicated gritter will also be sent out to ensure all access routes to schools are kept open. Once priority roads are clear, the team will look at side roads so that rubbish collections can still take place as part of the regular schedule. During severe weather, the Council’s street cleansing team will also do their best to keep pavements and bridges as clear as possible. Putting local people first Havering Council is working across the borough to build homes that put local people first and will help to deliver an exciting new chapter in the borough’s history, for the benefit of all who live and work here. Our regeneration projects aim to not only create new, high quality affordable homes for local people, but to also deliver a borough-wide legacy that means these new homes and our community will flourish and benefit from them for generations. When it comes to regeneration, though, it's not just about bricks and mortar. Social value represents all the things that are important to the Council and residents, but can’t be measured in the same way that financial value might be. By considering the wider economic, social and environmental effects that the Council’s plans have, more opportunities will be available for local people. The Council will make sure our neighbourhoods and homes are places that residents are proud to live and that they know will provide for their health and well-being. The focus will be on young people and older people to make sure they are socially included and can access opportunities that benefit them. “The designs put forward by the children were thoughtful and considerate with a strong emphasis on community facilities and sustainable interventions. Suggestions to improve the landscape by increasing the number of flower beds, benches, parks and cafes demonstrated their ability to plan for the benefit of the whole community. As well as the overall landscape strategy, their flexible and sustainable approach to roof treatments will be considered as part of the plans moving forward. There is also an opportunity to incorporate some mixed community uses within the open spaces." Opportunities Council and partner expertise will be used to increase the number of Havering residents entering employment or progressing in their careers. Supply chain opportunities will support business growth and development. If you are a local business and want to register for updates about contract opportunities, please visit: www.havering.gov.uk/ supplychain. Connections The Council will work with partners to give residents better access – through digital connectivity as well as through improving transport links, for example, by working closely with Transport for London and the development of the Crossrail. Through the Council’s 12 Estates/Wates joint venture alone, social value benefits for Phase One of the project are predicted to be worth around £6.8 million. Commitments include a comprehensive programme of community initiatives from school curriculum support to financial literacy workshops, catering and hospitality training, and the delivery of around 165 apprenticeships across the life of the scheme. Likewise, the initial proposals for the Rainham and Beam Park project predicts 37 construction apprenticeships and 77 training opportunities to people living within the borough, through the Notting Hill Genesis/Havering Council joint venture. Lynda Shepherd writes for Living in Havering about an ambitious local photography project. Lance Jackson poses with his 1964 Morris Minor, in front of St. Laurence Church by Bob Brabner APRS The Renee School of Performing Arts opened 16 years ago. Renee has a school at Cranham Community Centre and also in Romford and Shenfield. They hold an annual show in Southend. Renee is affiliated to the British Association of Teachers of Dance, for dancing exams. Her schools teach tap, ballet, modern, musical theatre, singing, and street jazz. Terry Murphy, a bodyguard in the 80s for Stringfellows nightclub, is no stranger to being photographed. He has owned and run “Fishy Business” for the past 25 years and is well known in Upminster as “Terry the Fish”. Terry Murphy, Fishy Business, Corbets Tey Road by Dave Wilcox DPAGB-AV Martin Saurma at Havering Sailing Club, Stubbers, Ockendon Road by Alf Ellis Martin is from Cape Town in South Africa. He has been in the UK since 2004 and lives in Upminster. He has been sailing for 33 years. He works as the Finance and Operations Director for a charity. “I enjoy looking at old photographs and seeing how things were and comparing them with today,” said Ken Slaney. Ken worked in newspapers as a printer before starting 1st Kenclean a drain cleaning and investigation company. their background and agreement to having their photograph taken. The project has also given the photographers a reason to venture into environments they would not have otherwise justified. “We have experienced a real sense of community and a privileged insight into how people of Upminster are ‘wired’. It has been fantastic to see under the surface and how people and organisations contribute to making Upminster such a nice town” said Dave. I asked Dave, how they would select prints. He explained: “Images are aimed to essentially capture people (mainly individuals) in their environment, and a moment in time. Some photographs will more naturally lend themselves to being an interesting portrait for display e.g. interesting hair style, tattoos etc. Each photographer has their own style, so this will also be evident in the exhibited pictures”. Saturday March 23 – Classic Cars and Live music 11am to 3pm Classic cars on display alongside the regular market stalls Vintage Lianna - with timeless elegance, beautiful vocals and authentic attire, Lianna will perform 50's and 60's rock'n'roll, jazz & doo-wop songs. Wednesday April 24 – St George’s Day celebration Cockney musical entertainer Harmonica Lewinsky will get you in the mood for a traditional East End knees-up Punch and Judy puppet show and medieval musicians A 4.5 metre long mystical and ancient animatronic dragon Loads of flags, and bunting to make it a day not to be missed. In 2017 across the UK 520,000 abandoned shopping trolleys were collected and returned to supermarkets. If you are fed up with seeing abandoned shopping trollies on your street or in your local shopping centre there’s now an app that will help get them collected. A new, free to download, app has been developed to make reporting abandoned shopping trolleys quick and easy. Available on most smartphones via the Google Play store or Apple store, the trolleywise app enables you to take a picture of the offending trolley and report it in just a few seconds. The app then automatically alerts the nearest Trolleywise collection team, who will then collect the trolley and return it to its rightful home. You will get an immediate message confirming if the trolley can be collected and then a second message when the trolley has been returned to the local store. In Havering trolleys are typically collected within just a day or two of Sub-brand logobeing reported. Under the HES umbrella are other service providers, such as HES catering services. Their logo should be shown as follows. The colour palette used is as page 16 of this guide. The logo should not be altered without permission from the Head of Education Traded Services. This year is the fiftieth anniversary of Romford Market being closed to through traffic. See the Historical Havering feature on page 28. Join our vintage market in March Royal Charter est. Pick up momentum for a healthier 2019, by making some easy swaps to improve your wellbeing. Anyone who has tried to stop a bad habit will know that it’s very difficult thing to do. One way of ditching a bad habit for good is to replace it with something new. Here are some practical swaps, which can be mixed and matched, depending on what you want to achieve. workout for your heart, and strengthen your bones and muscles. • S wap the ride on the escalator for the stairs or walk up the escalator. Small daily incremental gains add up to health benefits that really make a difference! Swap high sugar for low sugar alternatives Some foods and drinks contain a surprisingly high amounts of added sugar. Try these simple swaps to help keep your sugar intake within recommended maximum daily amounts. • S wap sugar-coated breakfast cereals for wholegrain options like porridge or shredded wholewheat cereal and add chopped banana or raisins. • S wap sugary drinks for water or diet and sugar-free options. • S wap sweet, flavoured yoghurts for plain yoghurt and add a few raspberries or blueberries. Swap smoking for e-cigarettes E-cigarettes can help you to stop smoking which means saving money, having more energy and looking better. Evidence shows that e-cigarettes are 95 per cent less harmful than tobacco. Find a vape shop retailer who can offer expert knowledge and advice by searching on the Independent British Vape Trade Association website: www.findavapeshop.com. Quitting smoking means more oxygen available to restore your skin’s natural glow. So when you quit your skin will improve and you’re going to look great! Swap a few minutes of social media time to focus on mental wellbeing It can be easy to rush through life without stopping to notice much. Paying more attention to the present moment – to your own thoughts and feelings, and to the world around you – can improve your mental wellbeing. Learning how to relax takes practice; a few minutes of mindfulness during the day or bedtime meditation can help to release tension, clear thoughts and improve mental wellbeing. Enter the word 'mindfulness' into the search box at www.nhs.uk for apps, audio guides, videos and further information. Rebecca Reid was still many years away from retirement when she started to consider what to do next. As a mental health nurse, working busy and often stressful shifts, she wanted to maintain an active lifestyle while bringing joy and happiness to someone else. After reading about fostering in a magazine, she decided to find out more and applied to do Havering’s Skills to Fostering training course. “I have got spare rooms as my children are grown up. I thought I could use the skills I’d learned in the hospital at home to make other people happy and to help young people to achieve their goals,” said Rebecca, a mother of four from Harold Hill. After speaking to her manager, she was offered parttime work, which gave her more time to focus on becoming a foster carer. When she began fostering in 2005, she said the process was very long, but now, although, still as rigorous, it can be as little as six months to be assessed and approved. “I went along to training where I met all kinds of people from different backgrounds. We exchanged our telephone numbers and ideas and we became friends,” said Rebecca, now 72. Mum Nikki has been so impressed with Butterflies that she can’t stop talking about it. If she overhears another mum talking about the difficulties of parenting, feeling depressed or struggling to cope, she invites them to come along to the weekly support group in Collier Row. Over the past year, the service for mums and dads who are struggling with depression and anxiety, has built up a solid group of parents who get advice and support and most importantly know that they are not alone in their situation. The group was set up by Perinatal Champions Natasha and Michelle to support parents to be and parents experiencing low mood, anxiety or depression after noticing a gap in this area. The service is believed to be one of a very few run across the country and a year since launching, more than 70 families, including fathers and partners, have been supported. Its success has led to plans for a second group to launch this year in the south of the borough. Mum Hayley lost one of her twins at birth seven months ago and was recommended to join the group by her health visitor. She said: “I wasn’t sure about attending at first as I thought it was going to be one of those ‘crying’ groups and I didn’t want that as I’m a really positive person. But it wasn’t like that at all. Everyone was so welcoming and it has made a really big difference to me. I haven’t looked back.” Meanwhile Nikki joined the group at the outset and has enjoyed it so much that as well as telling other mums about the group, she’s set up a Facebook Chat page so parents can speak to each other when the group isn’t meeting. She said: “I’ve learned how to pick up on depression in other people and refer them here so they can get help too.” Dad Taj was visiting the service for the first time to see how his wife Stacy and their son are being supported. “It’s good for me to have some time here. Not a lot of boroughs provide something like this.” On the day that Living in Havering visited, the mums chatted, while their children played. They then had a discussion around their aspirations for the year, before ending the session with a singsong. If they wished, they could also speak to health visitor Lindsey Batty. Lindsey said: “I know many people have tried to set up a postnatal support group and this is the most successful one I’ve seen. Michelle and Natasha are so supportive. If I refer someone, I know they will come into reception and give them a warm welcome. I think they do a fantastic job.” The session is run every Tuesday, at Collier Row Children's Centre in Clockhouse Lane, between 10am and 11.30am. Parents can drop in to the centre or check out the website. A leader by example everything, forever” says Danny. As a 26 year old autistic adult, Danny was at a low point feeling really down and not knowing where his life was heading, Fast forward seven years and Danny is successfully running a home, and is due to get married. Until 2018 he was co-chair of Havering’s Learning Disability Partnership Board and is an ambassador for supported housing. “I have found I can help people who can’t speak for themselves” says Danny. He now mentors prospective and new tenants. He also gives passionate talks and training around combatting hate crime and personal safety. He helps train GPs and hospital staff on learning disability awareness and he’s a frequent guest on local radio publicising Learning Disability Awareness Days. In December, Dimensions, a support organisation for people with learning disabilities and autism, announced their 2018 Leaders’ List. From more than 600 nominations across the country 60 winners were announced. These winners were people with learning disabilities and autism who the expert panel appointed by Dimensions felt were helping make society better for everyone. A Havering Council tenant who has learning disabilities and autism was one of those winners. Danny French has been influential in the work of the Council and the NHS locally as well as working with other organisations. He was helped by Family Mosaic, based in Western Road in Romford who also run weekly drop-in sessions in Collier Row and Harold Hill. “When I first came under the help and support of Family Mosaic I was really down, depressed and not knowing where my life was heading. That was because I had always lived with my parents and brother and sister. I have a brother and a sister, I’m the eldest. I shared a room with my brother for as long as I can remember and that was tough and difficult as it was like two grown men in a small house. I like my own space and company at times and that wasn't easy because at the time my brother was working in London and as such he would have to be up early and in the evening he would want the room to himself as much as I did. This led to arguments and that would get me stressed out and I found it difficult to sleep. But then I got referred to Family Mosaic. I had never lived away from home before or had had real independence. I was sent to look at Harold Wood Hall. At first I thought it sounded like a hostel but I looked at a tenant’s flat and I fell in love with how modern and fresh it was. After moving into Harold Wood Hall slowly but surely I grew in confidence and ability as I knew that I could cook for myself and pay utility bills on time and clean and keep my flat tidy. I now am a 'Tenant Rep' for Family Mosaic and I do other volunteering in my local community. I couldn't have done that at all without the encouragement and support of Family Mosaic. I am more outgoing, and I am now less scared than I was because I now know than I can be independent in the future because of the support given by Family Mosaic. Essex on Stage is an ambitious new two year programme led by the Queen’s Theatre in Hornchurch. It champions positive notions of Essex and outer East London, celebrates theatre made by working class people and raises aspirations for emerging artists from the area. It includes commissioning new plays, establishing a network of venues, touring drama about the area across the area, and organising local events to develop talent. Literary Associate for six years, running the theatre's writers' groups and advising on new work for the program. I can't wait to be back with a play of my own.” Alongside this play there will be rehearsed readings of new plays in development from three Essex playwrights – Sadie Hasler, Kelly Jones and Dan Murphy that can be heard in one day on Saturday 23 March. Essex on Stage has been made possible by support from The Clothworkers’ Foundation. Queen’s Theatre was the recipient of the 2018 Clothworkers’ Theatre Award, a competitive annual prize given to a regional producing theatre, that has only ever been awarded five times. Douglas Rintoul, the Artistic Director at the Queen’s Theatre said: "Essex on Stage is an exciting and vital two-year programme, championing positive notions of contemporary and historical Essex, celebrating theatre about and made by working class people from Outer East London and Essex. It will joyfully debunk some of the stereotypes while celebrating the unique character and voice of the region." 11.30am – Set in Dagenham, Tammy is a play about female sexuality, family secrets and the fractured relationship between mother and daughter. The play won the Wales Drama Award (BBC Writersroom and National Theatre of Wales) in 2014. 2.45pm – Legacy follows a group of builders working on the 20th floor of a luxury apartment block in Stratford, overlooking the Olympic Stadium on ‘Super Saturday’ 2012. As the world is glued to Britain’s greatest sporting day, the builders watch on as the place they call home becomes unrecognisable. Stiletto Beach by Sadie Hasler 5.30pm –When a beach is left burning, fingers are pointed at a gang of Essex Girls. But what is an Essex girl anyway, and why shouldn’t they burn it down? Mayor of Havering William Tansley Smith and Mayoress in a carriage at the ceremony to mark the closure of Market Place to through traffic and the opening of the Romford ring road. Sunday 14 September 1969. 2 of two halls built in the mid-19th Century in the area now occupied by the clocktower building at the top end of the Market Place. Laurie Hall was initially called the New County Court though it seems to have quickly proved unsuited to that purpose, and it sat alongside a second hall called St. Edward’s Hall. St Edward’s Hall was demolished in the 1870s. Laurie Hall was put to a variety of uses including as a literary institute where Charles Dickens is said to have performed, a wine and spirit merchant on the lower floor with the Catholic Apostolic Church and later the Romford Town Mission upstairs, and then in 1913 it was converted into a cinema. The Laurie Cinema continued through the Second World War and was renamed The Vogue, though its condition never matched the modernity of the name and it soon became a general purpose meeting room. In 1970, as part of the town’s redevelopment the hall was demolished. Vintage bus outside the old Littlewoods store as part of the same ceremony. 1. Market Place, Romford photographed on a market day in October 1967. The view includes Laurie Hall with the new Central Library in the background, as well as the now demolished Victorian villas of Laurie Square. In the 1960s much of the area that is now used for market traders was filled with parked vans and cars, and used for the through road and its bus stops. 2. Construction of the new ring road in Romford in 1970, showing the Laurie Hall and the then newly (opened in 1965), Central Library in the background. support to help the individual remain in work. 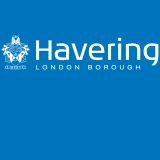 As part of the Local London Partnership, Havering has secured £800k through the Mayor of London’s Strategic Investment Pot, to be used to improve digital connectivity in the Rainham area. The new fibre connection will provide a world class infrastructure and could be used to help manage transport, traffic planning, community safety and environmental monitoring. It is also anticipated that the introduction of this new digital infrastructure will help to stimulate additional investment by the private sector, allowing for greater connectivity for businesses within the Rainham area. Through the introduction of new ultrafast (gigabit) broadband capable infrastructure, it will improve the financial case for suppliers to expand networks into this part of the borough and serve new business clusters. Toxic air in central London contributes to thousands of early deaths each year and is damaging Londoners’ health, especially among children, older people and people who live and work in the most polluted areas. From 8 April 2019, the Mayor of London is introducing a new Ultra Low Emission Zone in central London, operating 24 hours a day, every day of the year, in the same area as the Congestion Charging zone. It will contribute to improved air quality for millions of people in London. Meeting new, stricter emission standards As the ULEZ will apply to vans, lorries, coaches, buses, cars, motorbikes it will particularly impact any businesses sending vehicles to deliver or collect goods in central London. Electric and newer petrol and diesel models will tend to meet the new standards but for example diesel vehicles that are six years old and met the Euro 5 standard won’t. All vehicles will need to meet the new, stricter emission standards, or pay the daily ULEZ charge. This will be £12.50 per day for cars, motorcycles and vans (up to and including 3.5 tonnes), and £100 per day for heavier vehicles, including lorries (more than 3.5 tonnes) and buses/coaches (more than five tonnes). Some drivers and vehicles will qualify for a temporary discount or full exemption from the ULEZ charge. These include vehicles registered with a ‘disabled’ or ‘disabled passenger vehicles’ tax class and not-for-profit minibuses. ULEZ – an additional charge to the weekday Congestion Charge The ULEZ charge is in addition to the weekday Congestion Charge. It will replace the T-Charge (officially known as the Emissions Surcharge) which was introduced in October 2017. You can use an online vehicle checker to see if a vehicle meets the new ULEZ standards at www. tfl.gov.uk/ulez From 25 October 2021, the ULEZ will be expanded to include the inner London area, bounded by the North and South Circular roads. From 26 October 2020, throughout London, the most heavily polluting vehicles (including buses, coaches, lorries and other specialist vehicles) will need to meet even tougher standards as part of the London-wide Low Emission Zone (LEZ). This is in addition to the central London ULEZ charge. 19 High Street, Romford, RM1 1JU t 766 571 e info@haveringmuseum.org.uk www.haveringmuseum.org.uk Vivian Maier Talk by Dr. Ian Browne Saturday 27 April The talk will explore the fascinating and unravelling story of street photographer extraordinaire Vivian Maier. Between the 1940s – 80s Maier took thousands of photographs in Chicago and New York, capturing the many faces of twentieth century city life. The talk includes material exclusive to the Tate franchise. Tickets £5, including refreshments. Advance booking required. Claire Martin and Ray Gelato: ‘Let There Be Love’ Friday 1 March, 8pm Two of the world’s greatest jazz performers present an evening of cool classics from the American Songbook. Martin Turner (ex-Wishbone Ash) Friday 29 March, 8pm The founder of one of Britain’s finest progressive rock bands performs material from classic Wishbone Ash albums Argus and New England. The Who tribute band perform the legendary concept album in its full rock glory. What a Glorious Feeling - The Story of Singin’ In The Rain Tuesday 9 – Saturday 13 April A new musical inspired by true events; bringing to life the little known behind-the-scenes story of the tempestuous love triangle between Hollywood legends Gene Kelly, Stanley Donen and Jeanne Coyne during the creation of the musical Singin' in the Rain. Bette & Joan Thursday 25 – Saturday 27 April A powerful new biographical play which tells the story of the longstanding feud between screen goddesses, Bette Davis and Joan Crawford. www.queens-theatre.co.uk Kiss Me Quickstep Friday 22 February – Saturday 9 March A sequin-studded warm-hearted ballroom drama. This bittersweet comedy reveals the backstage stories behind the fabulous frocks, fixed smiles and fake tan, looking at the real lives of those for whom dancing is everything. lays bare the everyday struggles of a post-industrial generation of British men. MilkShake Live Saturday 13 April (2 performances) Milkshake Monkey can’t wait to put on a spectacular new musical for you all! But when stage fright hits, his favourite Milkshake friends come to help, creating the most dazzling show you have ever seen! The Hired Man Saturday 27 April – Saturday 18 May An epic and heroic musical tale of love, betrayal and loyalty, set against a backdrop of English country traditions being swept away as a new century faces the gathering storm of war. In Basildon Thursday 14 - Saturday 30 March A juicy slice of Essex family life written by Romford playwright, David Eldridge. A sharply funny play, charting an East End family’s history from the homelands of Hackney, via Romford, to Basildon and beyond. Cabinet and Full Council meetings are open to the public and are held at 7.30pm in the Council Chamber, Town Hall, Main Road, Romford, RM1 3BB. An Evening with England’s World Cup Winner Geoff Hurst Monday 18 March An unmissable event for football fans! Sir Geoff will be sharing stories and fascinating insights about his illustrious West Ham and England football career. Forthcoming meeting dates are as follows: Full Council – 20 March Cabinet – 10 April Annual Council meeting – 15 May They can also be watched online at www.havering.gov.uk/ webcast Dates may change, please check www.havering.gov.uk/ calendarmeetings for latest information. Romford Library – First Thursday of the month 2-3pm Upminster Library – Last Monday of the month 2-3pm / First Thursday 6-7pm TECHY BUDDIES Sessions with our volunteer Techy Buddies to help you with your ICT problems. Collier Row Library – Saturday 1.30-3.30pm Gidea Park Library – Wednesday – 5 week beginners course 10-11am (booking required) Harold Hill Library – Contact library for details. Compost Bin Offer The London Borough of Havering has teamed up with getcomposting.com to offer a limited number of discounted compost bins with a free kitchen caddy to its residents. This very special offer is available while stocks last on a first come first served basis and is limited to one compost bin with a caddy per household. * Promotional price includes delivery charge and free caddy Made from 100% recycled plastic. Offer available to residents of the London Borough of Havering. Please allow 28 days for delivery. Terms and conditions apply, see website for details.